Sarvananthan (2006) estimates that the informal economy forms 30 per cent of the Provincial GDP of the north-east. The PGDP for the north is the lowest in the country (the east being also low) due to lack of economical activity, but compensated by the informal economy. The informal economy would include the extra-legal trade of goods across the various borders into the north-east, various small commercial ventures, foreign remittances, and the income and expenditure of the LTTE. The illicit movements of goods across various borders and from India could be quite extensive, particularly when the state imposed various embargoes or blockades. The cost due to risky transport across jungles, borders or the sea and the payments to various authorities at borders and elsewhere as bribes to let them through as well as other expenses such as multiple taxes and profits had to be borne by the civilians. Thus the exorbitant prices in the north-east increased the cost of living for a population already displaced and deprived of regular income. But the extraordinary fact is that most goods were available, at a price! During the severe embargo by the state on all types of essential goods to Jaffna after 1990, when the land route was cut off, most goods were still available on the pavements of Jaffna town. From the ubiquitous Panadol,3 which people believed cured all kinds of ills,4 to petrol which was selling at 30 times the normal rate, everything people needed for their daily living was available. During the 24-hour curfew that lasted almost a month in October 1987 when the Indian army shot people on sight, enterprising traders moved through internal by-lanes (olungays) to keep the small, informal shops in the interior supplied with essential goods (Somasundaram, 1998). Thus, as Nordstrom (2004) maintains, the informal economy is vital to sustain a civilian population during hard times in war zones. It is estimated that due to fighting and the collapse of most traditional occupations and income, people in the north-east have become dependent on outside remittances. As Sarvananthan (2006) points out, this is not a new phenomena in Jaffna where traditional breadwinners, due to lack of resources and the harsh climate, had ventured out to the south and abroad for employment and earnings which they remitted back to their families. This was one of the causes for increasing hostilities against the Tamils in the south when competition for jobs became more acute due to population pressures. With the civil war, the whole economy and families in the north-east, particularly Jaffna, have become heavily dependent on outside remittances for their survival.5 However, the remittances are now more from abroad. In the east, a good number of women have gone to the Middle East as housemaids, to earn money for their families causing severe family problems in their homes. In the north, it has also been migrants, refugees and asylum seekers in Western countries sending back part of their earnings or meagre welfare payments through ‘hawala’ that have kept the home fires burning. It is said that each family has at least one member, if not more, abroad who then supports their family back home. For asylum seekers their families would have sacrificed considerable finances in payments to human smugglers, unscrupulous agents (transactions where they are easily cheated), and to meet the expenses involved in complicated passages through inhospitable routes to get their family member to safety. For those whose asylum issues are still pending in their host country, there is a pressure from the family back home, who would have sacrificed an enormous fortune to get him there, to keep the conflict going, as host countries have a tendency to start repatriating asylum seekers as soon as there is some semblance of cessation of hostilities. A dominant part of the informal economy of the north and east is the LTTE’s financial empire. Although it is difficult to estimate the extent of their finances, Jane’s Intelligence Review (2007) and Sarvananthan (2006) have estimated the LTTE generate around US$200–300,000,000 per year through their earnings in Lanka, both uncleared and cleared areas including Colombo, and abroad. 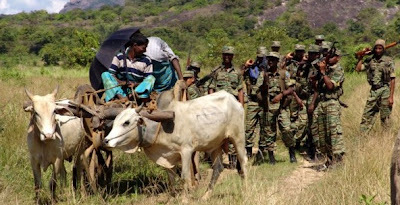 Locally the LTTE earns through numerous direct and indirect taxes, commercial ventures, extortion, siphoning from GO and NGO sectors, and various other sources and means. Taxation includes a fixed income tax on salaries and earnings (Saravananthan (2006) gives this as 8%), including state employees both in the cleared and uncleared areas of the north and east, which is collected in a regular manner, for example as an almost ‘official’ deduction before salary payments in the finance section of the organization. There can also be special ‘deductions’ for various reasons such as a defence levy, Pongu Thamil celebrations, etc. All businesses, occupations and produce are taxed varying amounts. In the formal economy of Lanka the north-east is allocated the lowest regional amount while the defence budget has been soaring, reaching 166.4bn rupees ($1.48bn) annually. However, this is but the tip of the actual expenditure. Defence spending is often done under other headings and votes. For example large-scale training abroad is often done under foreign agreements and aid. Transport, food and other incidental costs can be borne by other departments, including the local District budget. I have been reliably informed that much of PGDP for Jaffna comes from foreign aid allocations. However, the large-scale military spending does not benefit the local population in Jaffna. None of them are in any of the security forces, which are completely Sinhala (Library of Congress, 2009). So none of the inflated salaries or incentives of the armed forces benefit Tamils. Though the state formally continues to pay the salaries, none of the benefits like overtime and other extra payments (‘bata’) reach the Tamil populations. Cadre positions have been cut while vacancies are not filled (Somasundaram, 2005). There are no large-scale development programmes comparable to the south, no industrial or economic investments, infrastructure development, market access or circulation of money. The economy of Jaffna has been in a frozen state except for the remittances from aboard. Thus the Jaffna population is a deprived area from the state economic point of view and people learn to survive on low or absent incomes. The phenomenon of parallel governments, where two states, Lankan and Indian, and various Tamil militant and paramilitary groups vied for power and control, trying to rule and govern was seen in Jaffna, northern Sri Lanka from 1983 to the present. The international community has also increasingly become a stakeholder, attempting to mediate and influence events, even advocating the right to protect (R2P) civilians when the state fails to do so. Between these contending powers was the underworld and transnational shadow-world of arms traders, smugglers and international racketeers making a quick profit. Tactics of terror and counter terror were used to pacify and control the population. Massacres, arrests, detentions, abductions, torture, extra-judicial killings, forced displacements, conventional and guerrilla style warfare, restrictions and embargos on travel and essential items and other nefarious means were used widely. Power and control became very pervasive extending into government bodies, state institutions, schools, social and community organizations and public day-to-day events. As a result, the Tamil community was depopulated, leaders eliminated or intimidated and people became silent, passive and compliant. This article is an updated and developed version of the paper, ‘Parallel governments – living between terror and counter terror in Jaffna (1982–2006)’ presented at the conference, Globalizing Religions and Cultures in the Asia Pacific, University of Adelaide, 1–5 December 2008. 1. Sivaram was the foremost military analyst and journalist in Lanka who was himself extra-judicially killed in 2005, a victim of CI, possibly at the hands of paramilitary aligned to the state. 2. Informers usually wear a hood over their heads, to hide their identify for fear of later reprisals, and in the Lanka context, the hood is made of sack cloth with slits for the eyes. Suspects are then paraded before them and they usually indicate, commonly by nodding or other sign, who is implicated. The informers, usually friends or comrades, are often under threat of further torture or death if they do not point people out (Doney, 1998). 3. Counterfeit, out of date, SPC (State Pharmaceutical Corporation) drugs, which should legally be in state hospitals where there is chronic shortage for the same drugs and banned (not hard, narcotic drugs but ordinary medical drugs long withdrawn from the market due to lethal adverse effects) drugs were freely available over the counter or on pavements. Most of the cheaper varieties were from India where the pharmaceutical industry had suddenly taken off. 4. I was treating an old lady with somatoform disorder who used to swallow Panadol on hearing bomber planes overhead (see case history in Somasundaram, 1998). Possibly it would prevent the subsequent headache? 5. The funds from the remittances and other payments (salaries) are either recycled back out of the Jaffna peninsula or do not physically reach there as they are spent on the purchase of essential and commercial goods, payment for agents, informal taxes and the like or go into savings. The actual net flow of money is thus out of Jaffna to Colombo and foreign countries. Hardly anything is spent or invested locally, the local economy stagnates as a consequence. Amato EJ (2002) The tail of the dragon: Sri Lankan efforts to subdue the Liberation Tigers of Tamil Eelam. Thesis, US army Command and General Staff College, Kansas. Amnesty International (1986) Sri Lanka Disappearances. London: Amnesty International. Baykai T, Schlar C and Kapken E (2004) International Training Manual on Psychological Evidence of Torture. Istanbul: Human Rights Foundation of Turkey. Bronfenbrenner U (1979) The Ecology of Human Development: Experiments by Nature and Design. Cambridge, MA: Harvard University Press. Camus A (1971) The Rebel, A. Bower Trans. UK: Penguin Books. de Mel N (2007) Militarizing Sri Lanka: Popular Culture, Memory and Narrative in the Armed Conflict. New Delhi: Sage. Doney A (1998) The Psychological After-Effects of Torture: A Survey of Sri Lankan Ex-Detainees. In: Somasundaram D (1998) Scarred Minds. New Delhi: Sage Publications, 256–287. Evans G (2007) The limits of state sovereignty: The Responsibility to protect in the 21st century (eighth Neelam Tiruchelvam Memorial Lecture). Colombo: International Centre for Ethnic Studies (ICES). Available at: http://www.crisisgroup.org/home/index.cfm?id=4967. Green L (2004) Living in a state of fear. In: Scheper-Hughes N and Bourgois P (eds) Violence in War and Peace: An Anthology. Massachusetts: Blackwell Publishing, 186–195. Hassan R (2008) Suicide bombings: Homicidal killings or a weapon of war? Asian Journal of Social Science 38(3): 462–480. Hobfoll, S. (1998). Stress, culture, and community: the psychology and philosophy of stress. New York: Plenum Press. Hoole MR, Somasundaram DJ, Thiranagama R and Sritharan K (1988) Broken Palmyra. Claremont, CA: Harvey Mudd College Press. Hoole R (2001) Sri Lanka: The Arrogance of Power, Myths, Decadence, and Murder. Colombo: University Teachers for Human Rights (Jaffna). Human Rights Watch (2008) Recurring Nightmare: State Responsibility for ‘Disappearances’ and Abductions in Sri Lanka. New York: Human Rights Watch. Jane’s Intelligence Review (2007) Feeding the Tiger – How Sri Lankan Insurgents Fund their War. Jane’s Intelligence Review. Kitson F (1971) Low Intensity Operations: Subversion, Insurgency, Peace-keeping. London: Faber & Faber. Kitson F (1977) Bunch of Five. London: Faber & Faber. Lawrence P (2000) Violence, suffering, Amman: The work of oracles in Sri Lanka’s eastern war zone: In Das V, Kleinman A, Ramphele M and Reynolds P (eds) Violence and Subjectivity. Berkeley: University of California Press, 171–204. Library of Congress (2009) A Country Study: Sri Lanka: Ethnic Composition of the Armed Forces. Available at: http://memory.loc.gov/frd/cs/lktoc.html. Nandy A (2009) Narcissism and despair. The Little Magazine VII(3&4). Available at: http://www.littlemag.com/security/ashisnandy.html (accessed 7 July 2010). Nordstrom C (1994) Warzones: Cultures of Violence, Militarisation and Peace. Working Paper No. 145. Canberra: Peace Research Centre, Australian National University. Nordstrom C (2004) Shadows of War: Violence, Power, and International Profiteering in the Twenty-First Century. Berkeley: University of California Press. Partners (1999) Sri Lanka: The forgotten war. World Mission Partners 11(1): 14. Somasundaram D (1998) Scarred Minds. New Delhi: Sage Publications. Somasundaram D (2005) Health and Human Rights in the Jaffna Peninsula. Colombo: Human Rights Commission of Sri Lanka. Somasundaram D (2007) Collective trauma in northern Sri Lanka: A qualitative psychosocial-ecological study. International Journal of Mental Health Systems 1(1): 5. Somasundaram D (2008) Psycho-social aspects of torture in Sri Lanka. International Journal of Culture and Mental Health 1(1): 10–23. Taussig M (2004) Culture of terror – space of death: Roger Casement’s Putumayo Report and the explanation of terror. In: Scheper-Hughes N and Bourgois P (eds) Violence in War and Peace: An Anthology. Massachusetts: Blackwell Publishing, 39–53. Trawick M (2007) Enemy Lines: Childhood, Warfare, and Play in Batticaloa. Berkeley: University of California Press. University Teachers for Human Rights – Jaffna (UTHR-J) (1994) From Manal Aru to Weli Oya. Special Report 5. Colombo: UTHR-J. Available at: http://www.uthr.org/SpecialReports/spreport5.htm. University Teachers for Human Rights – Jaffna (UTHR-J) (2007) The Human Rights and Humanitarian Fallout from the Sri Lankan Government’s Eastern Agenda and the LTTE’s Obduracy. Briefing No. 6. Colombo. Available at: http://www.uthr.org/Briefings/Briefing6.htm. University Teachers for Human Rights – Jaffna (UTHR-J) (2009) A Marred Victory and a Defeat Pregnant with Foreboding. Colombo: UTHR-J. Available at: http://www.uthr.org/SpecialReports/spreport32.htm. US Army (2006) Counterinsurgency. FM 3-24. Washington, DC: US Army. Available at: http://www.fas.org/irp/doddir/army/fm3-24fd.pdf. Vijayasiri R (1999) A critical analysis of the Sri Lankan government’s counter insurgency campaign. Thesis, Kansas, US Army Command and General Staff College. Whitaker MP (2007) Learning Politics from Sivaram. London: Pluto Press.